Beaded Jewelry Tutorials for a Scientist? 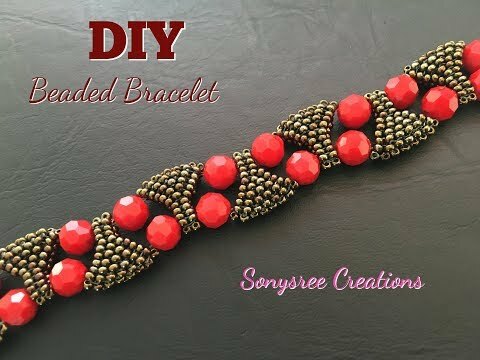 Something about Sonysree Creations' beaded bracelet tutorial caught my attention. I couldn't quite put my finger on the why for a while. It is a lovely and simple design for those who want a quick project. And it has a contemporary look about it. Then I realized what it was! The seed bead sections look like erlenmeyer or conical flasks which are found in laboratories! This design will be perfect for a scientist! This designer uses monofilament (fishing line) which is trickier to use than the typical beading threads like Fireline. She explained why, "I had lots of problems with monofilament when I was started working with it. I love work with Fireline, Wildfire etc . But those threads are more expensive, I can't afford it. I don't want stop beading because of thread. Beading is my passion. So I started loving monofilament . "Something is better than nothing " .. Now I can manage with monofilament..we are good friends now ...( except peyote stitch)". It is a versatile design as you can use either 11/0 or 10/0 seed beads. If you prefer 10/0 seed beads and can't find these locally, check this source. And here is the necklace version. Note how she added extra large beads to help the design curve more. That's a lovely design. So perfect for you Pearl! Thank you for this tutorial, Pearl. You are terrific, for bringing us all these new styles and teachers.